Lee Boudreaux Books, 9780316300674, 320pp. Daniel Bergner is a contributing writer for the New York Times Magazine and the author of a novel, Moments of Favor, and four books of nonfiction: What Do Women Want?, The Other Side of Desire, In the Land of the Magic Soldiers, and God of the Rodeo. In the Land of Magic Soldiers received an Overseas Press Club Award for international reporting and a Lettre-Ulysses Award for the Art of Reportage and was named a Los Angeles Times Best Book of the Year. God of the Rodeo was a New York Times Notable Book of the Year. In addition to the New York Times Magazine, Daniel's writing has appeared in the Atlantic, Granta, Harper's, Mother Jones, Talk, and the New York Times Book Review, and on the op-ed page of the New York Times. His writing is included in The Norton Reader: An Anthology of Nonfiction. 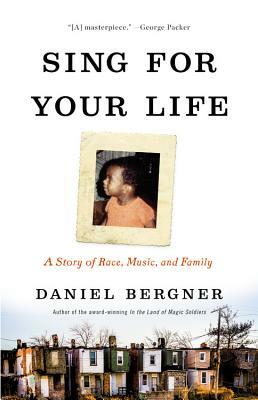 "Gripping and inspiring...Bergner chronicles the auditions and vocal contests as the struggles Green faces as a black man entering a musical world that is mostly white, delivering a moving portrait of a young man who succeeds, along with the help of encouraging teachers." "Bergner brings Green and [his] mentors to vivid, heroic life.... Bergner's inspirational biography has instant appeal, and, with the added attention to vocal techniques and rehearsals, readers with an interest in music will be especially rewarded." "Bergner richly weaves Green's rising stardom with scenes from a daunting childhood.... In less skilled hands, Sing For Your Life might mimic a cliched rag-to-riches fable.... Instead, Bergner presents a far more nuanced and rigorous examination of the institutional forces that shape Green's life.... It's Green's sense of pride, of his connection to his history, to his heritage, that Bergner so delicately captures in this melodious narrative for which we, the readers, hang on every word." "Prepare for a feast.... A study in discipline and artistry, musical agility, opera itself and the role that race has played in all of it, this would be an enlightening read even without Green. His story makes it unforgettable." "Bergner pieces together this remarkable life with an impeccable knack for storytelling.... Sing For Your Life is a first-rate biography of a beaten-down young man who rode the opera train all the way to Lincoln Center." "Sing for Your Life is a study in voice: part technical account of the vocal instrument, part celebration of its mysterious capacity to move us through song.... [The book] deserves praise, maybe even a year-end reward. It has so many of the qualities that critics and readers admire: a sympathetic hero whose life sketches an arc from tragedy to triumph; a treasured glimpse behind the high-culture curtain." "A first-rate psychological thriller.... Bergner cross-cuts between Green's violent, impoverished childhood and his ascendance onto the global opera stage. The result is a stirring prelude to a career dangling on the edge of greatness, as well as a courageous exploration of nature and nurture rarely addressed in cautious industry discussions on diversity."